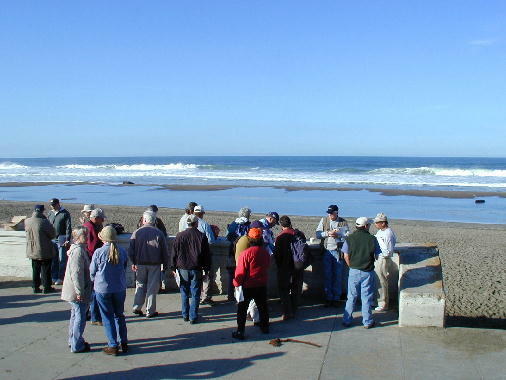 On an unusually warm Saturday in mid-November, a group of about 30 NCGS members and friends attended a field trip led by Monty Hampton (retired USGS) to examine the coastal geology and processes at seven stops from Ocean Beach in San Francisco to Half Moon Bay. Tridib Guha organized this field trip as a follow-up to an earlier NCGS lecture by Monty Hampton on June 29, 2005. Monty was assisted by several colleagues including: Robert McLaughlin (USGS), Orville Magoon (retired Corps of Engineers), Thomas Kendall (Corps of Engineers), Peter Mull (Corps of Engineers), Leslie Ewing (California Coastal Commission), Raymond Sullivan (emeritus SFSU), and Julian McCurrach (Princeton resident / business owner). The first two stops were located at Ocean Beach in San Francisco near Balboa Street and south of Sloat Blvd. 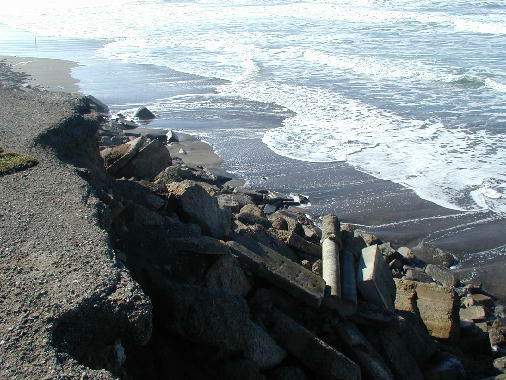 Ocean Beach in San Francisco is relatively wide at its northern end where depositional processes predominate and narrows significantly towards the south where erosional processes pose a threat to city infrastructure. 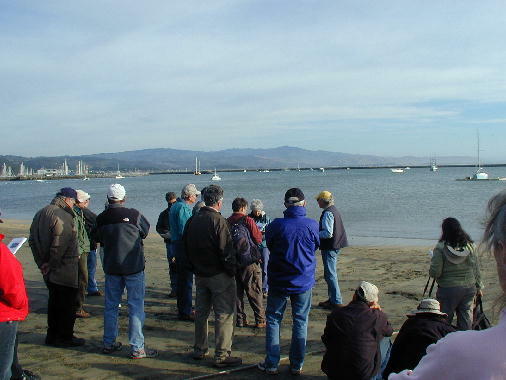 At the first stop, Monty Hampton and colleagues provided an introduction to the sediment dynamics of the San Francisco Bay-Ocean Beach system as well as the history of the 1.5-km long O’Shaughnessy seawall built between 1915 and 1929 to protect the Great Highway. Ocean Beach and the extensive dune fields that covered many areas of San Francisco formed during the post 20,000 year rise in sea level. West of the Golden Gate Bridge, the seafloor is covered by one of the largest sand wave fields in the world as well as the seaward San Francisco Bar, an ebb-tidal delta covering over 100 km². 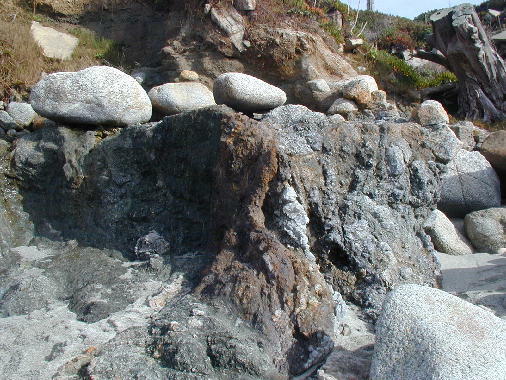 Both of these geomorphic features are fed by sediment flushed out of San Francisco Bay and shaped by the strong tidal currents and storm waves originating in the Pacific Ocean. An understanding of these large-scale features is very important because Ocean Beach is strongly affected by tidal currents emanating through the Golden Gate as well as wave refraction around the San Francisco Bar. 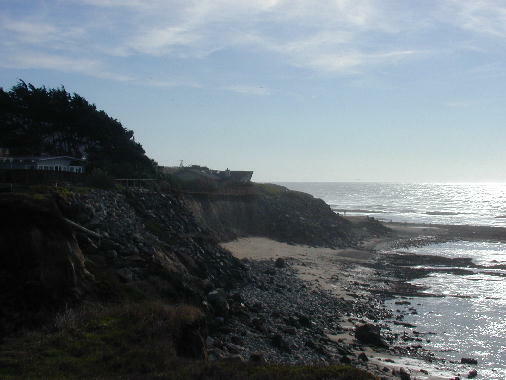 A strong eddy that spins off Point Lobos, near the Cliff House, during peak ebb flow results in a narrow band of northerly water flow and sediment transport, resulting in a wider beach at this end of the city despite a predominantly southerly flow of water out of San Francisco Bay. Ocean Beach is a high-energy system with classic offshore bars and troughs that are scoured by powerful rip currents. 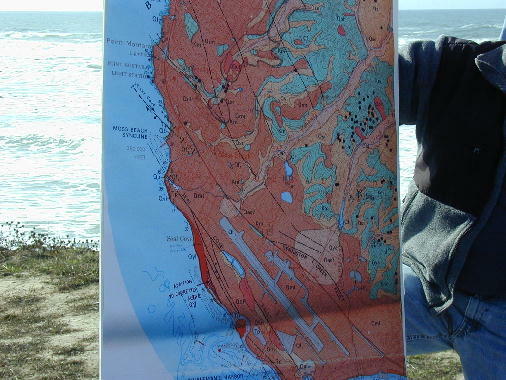 Ray Sullivan led the presentation about the tectonic setting, San Andreas Fault, sedimentary geology, and geologic hazards at Mussel Rock in Daly City. 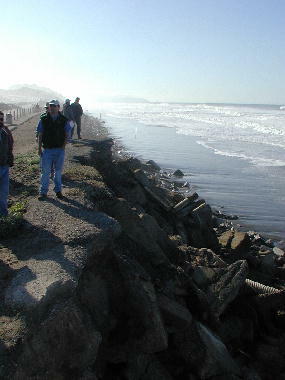 The coastal zone south of San Francisco is an example of an area where rapid urban development took place in the post-World War II years without an adequate understanding of geologic hazards. Housing developments expanded rapidly into this area between the late 1950s and early 1970s. 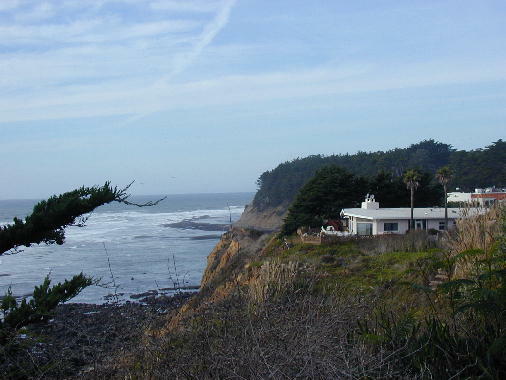 Many of the homes with spectacular ocean vistas are perched precariously above cliffs adjacent to the San Andreas Fault and were constructed on poorly consolidated sediments. 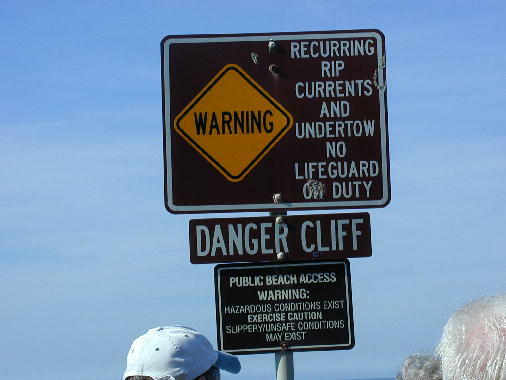 Landslides, slumping, and erosion have caused rapid retreat of the cliff line, which has caused numerous perimeter homes to be condemned and abandoned. Ray also provided insights into a little known report about damage assessments to new homes following the local 1957 M5.3 earthquake. About half of the 580 homes of the Westlake Palisades development needed repair from this moderate tremor. Surprisingly, Bonilla (1959) showed that homes on artificial fill were generally less damaged than those built on nearby natural sediments. 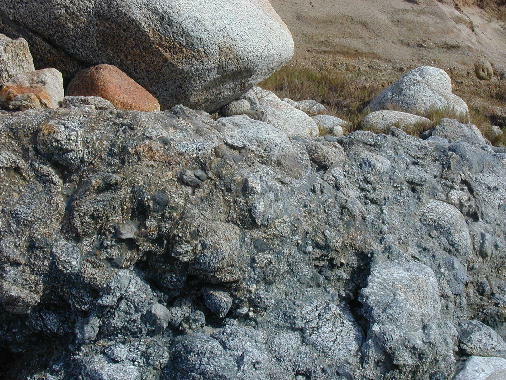 The explanation for this unusual observation was that the fill material was well engineered and compacted. 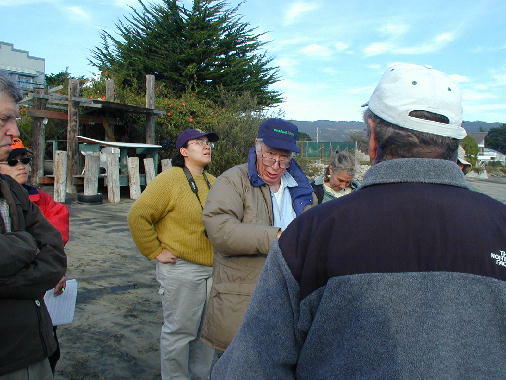 Robert McLaughlin summarized the structural and sedimentary geology at Moss Beach and James Fitzgerald Marine Reserve. 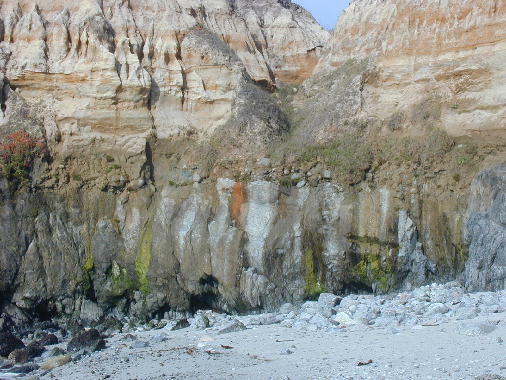 The Pliocene Purisima Formation is interpreted to have been deposited in a strike-slip basin within the San Gregorio-Seal Cove fault system. 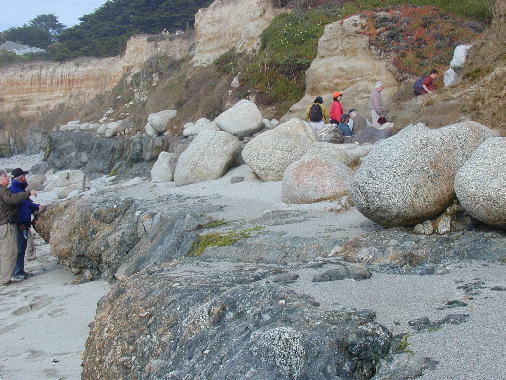 At the most spectacular outcrop of the day, the participants examined a nonconformity between the Mesozoic granitic rocks and overlying lag deposit of granite boulders in the Purisima Formation, that ranged up to three or four meters in diameter. 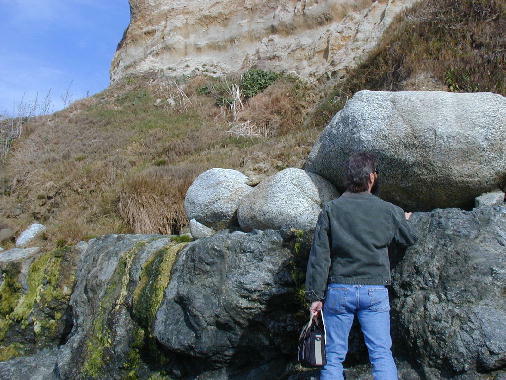 In the same Cove, the Purisima strata are folded into a plunging syncline on the southwest side of the fault. As an aside, the James Fitzgerald Marine Reserve is also one of the most accessible and best places to introduce children to tide pools in the Bay Area. 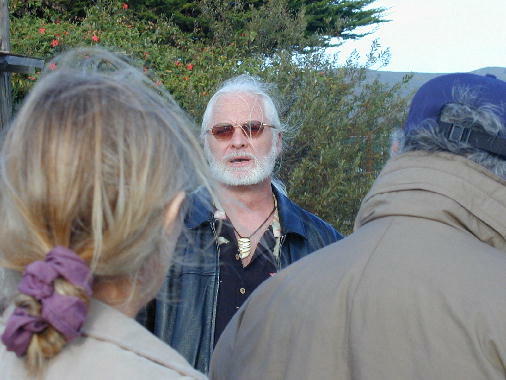 At the sixth stop, Monty Hampton provided a brief overview to the colorful history of the Moss Beach Distillery and restaurant, which occupies a romantic location on a high bluff overlooking the Pacific. 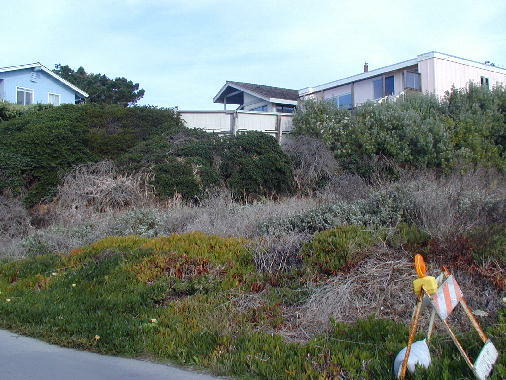 In the nearby residential area, the discussion focused on the arcuate, steep, and highly irregular patched road surfaces that represent the scarps of deep-seated landslides in the Purisima Formation. Pampas grass was also present in numerous locations on the hummocky topography. Interestingly, one of the homes was for sale and the visiting real estate agent undoubtedly wished that our group would move along quickly to the final stop. At the final stop in Princeton, Julian McCurrach provided a citizen and business owner’s perspective on erosion of the local beach and policy issues that are important to the community. 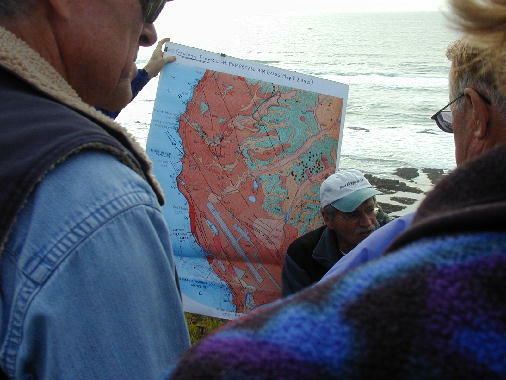 In summary, the NCGS members were fortunate to hear about coastal geology, processes, and policy issues from a diverse group of field trip leaders. From a personal perspective, it was interesting to learn about the rapid rates of geologic change and the intersection with the human time-scale. 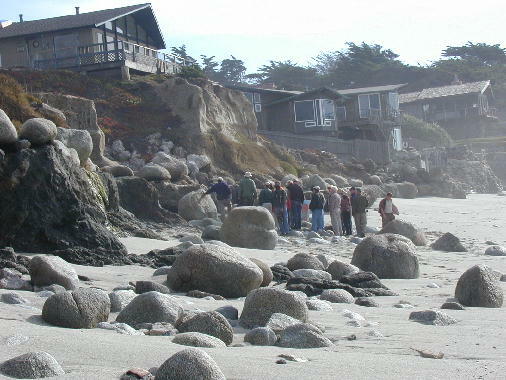 I’ve incorporated the example of the Pacifica homeowner’s experience into one of the questions in my final exam at DVC, to provide students with a realistic case history illustrating why an understanding of geology is important to their lives.